Found this guy in Zul'drak, wandering east of Ebon Watch in the Reliquary of Agony. Tooltip classification listed him as a rare elite, however, he only had about 15k health and he hit me for only a couple hundred on cloth. Definitely not typical elite stats. Not sure if he pats or really if he has any special abilities, as he went down pretty quick. Easy to spot in the area though, as he is the only wight model amongst the abominations, ghouls, and trolls. Ran into this fellow in Zul'Drak. Dropped Ethereal Terror Handwraps of the Marksman, and a satchel with 20 Frostweave and about 16g in it. Not bad for such an easy kill. I found him at 23, 61. Found him just standing next to a tree in The Dead Fields at 26,56. Very easy kill. Dropped Ethereal Terror Handwraps of the Marksman, and the Abandoned Adventurer's Satchel which contained 23 Gold and 20 Frostweave Cloth. Found on Genjuros today at 12:20pm at co-ords 26;71. I found and killed this guy back in January. At the time I didn't realize how rare these spawns were so didn't think about getting a screen or jotting down the location. However he is extremely easy to down, which is nice in the case that there are other players trying to steal your kill. I also received the 20 Frostweave, 18 to 20-ish gold and the Terror Handwraps of the Necromancer. why did i get 30K xp when i killed this guy? Hits for about 600 a hit on an 80 clothie, so may be a challenge to solo for a lower level. Found and killed at 26.54 (Reliquary of Pain). Found just a minute ago, easy kill, took all of 15 seconds for me and my lvl 75 wolf to down him. I am 77. I found the Zul-Drak sentinel and started killing him during some server instability. Silly me, I didn't kill him as fast as I could. I tried to hold him (I'm a priest) until another guildie arrived to share in the kill. Bad move, as the world server went down before he died. Upon logging back in two minutes later he had despawned and was nowhere to be found. Interestingly, I found Griegen up nearby when I logged back in. I hadn't checked the area so I can't say for sure whether he had been up before I pulled the Sentinel or not. (I then flew to the Howling Fjord where I found King Ping up. So these guys can be spawned after the world server comes up). Spawns right after server reset. =) So if you're lazy like me, wait until your server comes up on Tuesday and go for it! Killed at 931 am October 5th, 2009 at the 26.9,70.4 location on the Kul Tiras server (central time). Also found this mob an easy kill. Happy Hunting. Probably the brother of Feugen. Pretty easy, especially considering he is classified as "elite". Stumbled across him at 17, 71. Earned about 37000 xp at level 73. He dropped his leather gloves, 20 Frostweave, and 15g. taken down easily by my lvl 81 ret. paladin. was flying from the argent strand to K3 when my NPC scan went off. Flew back around macroing for him. time: 3:33am pacific time / 12:32am realm time. Just bagged him with my lvl 77 hunter. no problems. Just killed him on Lothar. Lothar is full of rare NPC's this morning! 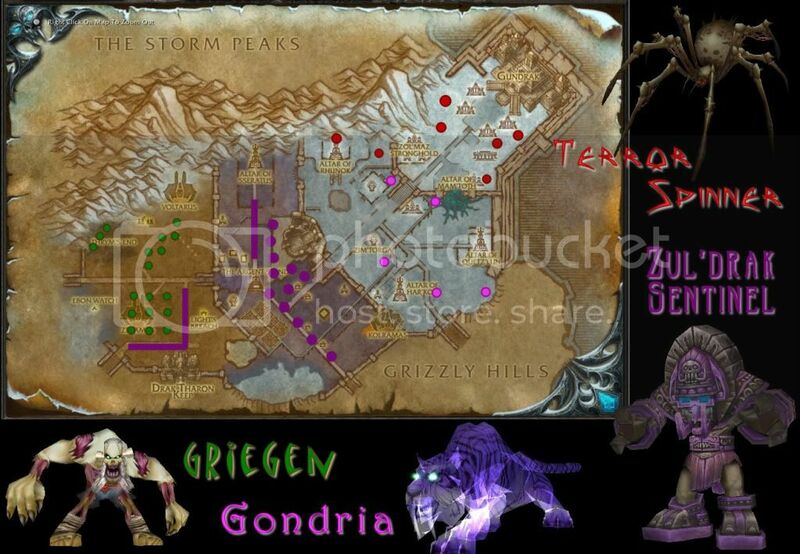 So far I've killed Griegen, Gondria (well I tamed her), and Terror Spinner. It took all of about 4 shots for my lvl 79 BM hunter to kill him. Very easy. Just got him at (25, 76) 5 mins ago at 00:06, EU Server The Sha'tar. Looted, took screenshot (fogot when in battle) and carried on to solo Utgarde Pinnacle. 20:00 found him a terror spinner while digging up some dirt. Found 14,6 - 56,8 server US - Runetotem at 7:45 am! NPC Scan goes off every time I fly into Griegen's area but I'm not finding him. Is anyone else having this issue? Just wondering if the game is bugged or NPC Sca is having issues. After three days of camping, I finally found him! Coords were 22.6,61.2. I wanted his sweet gloves for transmog and now they are mine :D The bag had just over 19g and a stack of frostweave cloth! After over 6 years of hunting Griegen, I found him today where I logged out the night before. I couldn't believe it. I now have less than 10 Northrend Rare Spawns to find, over half done!